2a : the power or right to choose : freedom of choice He has the option to cancel the deal. c : a contract conveying a right to buy or sell designated securities, commodities, or property interest at a specified price during a stipulated period also : the right conveyed by an option The ad is for a condo to rent with an option to buy. b : an item that is offered in addition to or in place of standard equipment A sunroof is one of the options that you can get with the car. You have the option of staying home or coming with us. He has the option to cancel the deal. We have a wide range of options available to us. Menu options at the café include soups, salads, and sandwiches. Select an option from the drop-down menu. Filing taxes online is an option for people with Internet access. I had no option but to start over. A good option is to do the work yourself. Employees will each be granted options to buy 1,000 shares of company stock. The option must be exercised within five years. These example sentences are selected automatically from various online news sources to reflect current usage of the word 'option.' Views expressed in the examples do not represent the opinion of Merriam-Webster or its editors. Send us feedback. An option is a financial contract that gives an investor the right, but not the obligation, to either buy or sell an asset at a pre-determined price (known as the strike price) by a specified date (known as the expiration date). Options are derivative instruments, meaning that their prices are derived from the price of their underlying security, which could be almost anything: stocks, bonds, currencies, indexes, commodities, etc. Many options are created in a standardized form and traded on an options exchange like the Chicago Board Options Exchange (CBOE), although it is possible for the two parties to an options contract to agree to create options with completely customized terms. There are two types of options: call options and put options. A buyer of a call option has the right to buy the underlying asset for a certain price. The buyer of a put option has the right to sell the underlying asset for a certain price. Every option represents a contract between the options writer and the options buyer. The options writer is the party that "writes," or creates, the options contract, and then sells it. If the investor who buys the contract chooses to exercise the option, the writer is obligated to fulfill the transaction by buying or selling the underlying asset, depending on the type of option he wrote. If the buyer chooses to not exercise the option, the writer does nothing and gets to keep the premium (the price the option was originally sold for). The options buyer has a lot of power in this relationship. He chooses whether or not they will complete the transaction. When the option expires, if the buyer doesn't want to exercise the option, he doesn't have to. The buyer has purchased the option to carry out a certain transaction in the future -- hence the name. Investors use options for two primary reasons: to speculate and to hedge risk. Rational investors realize there is no "sure thing," as every investment incurs at least some risk. This risk is what the investor is compensated for when he or she purchases an asset. Hedging is like buying insurance. It is protection against unforeseen events, but you hope you never have to use it. Should a stock take an unforeseen turn, holding an option opposite of your position will help to limit your losses. Call Option -- Option to purchase the underlying asset. Put Option -- Option to sell the underlying asset. Options Contract -- The agreement between the writer and the buyer. Expiration Date -- The last day an options contract can be exercised. Strike Price -- The pre-determined price the underlying asset can be bought/sold for. Intrinsic Value -- The current value of the option's underlying asset. Time Value -- The additional amount that traders are willing to pay for an option. Vanilla Option -- A normal option with no special features, terms or conditions. American Option -- Option that can be exercised any time before the expiration date. European Option -- Option that can be exercised only on the expiration date. Exotic Option -- Any option with a complex structure or payoff calculation. 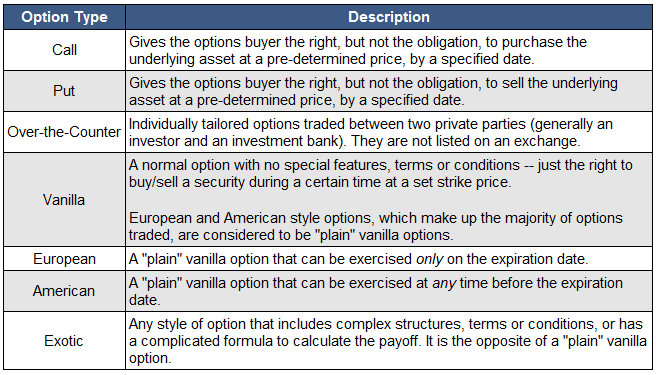 More option-related definitions can be found at the InvestingAnswers Option Category Page. A call option gives the holder the right, but not the obligation, to purchase 100 shares of a particular underlying stock at a specified strike price on the option's expiration date. Options are derivative instruments, meaning that their prices are derived from the price of another security. More specifically, options prices are derived from the price of an underlying stock. For example, let's say you purchase a call option on shares of Intel (INTC) with a strike price of $40 and an expiration date of April 16th. This option would give you the right to purchase 100 shares of Intel at a price of $40 on April 16th (the right to do this, of course, will only be valuable if Intel is trading above $40 per share at that point in time). Note that the expiration date always falls on the third Friday of the month in which the option is scheduled to expire. Every option represents a contract between a buyer and seller. The seller (writer) has the obligation to either buy or sell stock (depending on what type of option he or she sold; either a call option or a put option) to the buyer at a specified price by a specified date. Meanwhile, the buyer of an option contract has the right, but not the obligation, to complete the transaction by a specified date. When an option expires, if it is not in the buyer's best interest to exercise the option, then he or she is not obligated to do anything. The buyer has purchased the option to carry out a certain transaction in the future, hence the name. As a quick example of how call options make money, let's say IBM stock is currently trading at $100 per share. Now let's say an investor purchases one call option contract on IBM with a $100 strike and at a price of $2.00 per contract. Note: Because each options contract represents an interest in 100 underlying shares of stock, the actual cost of this option will be $200 (100 shares x $2.00 = $200). When the option expires, IBM is trading at $105. Remember: The call option gives the buyer the right to purchase shares of IBM at $100 per share. In this scenario, the buyer could use the option to purchase those shares at $100, then immediately sell those same shares in the open market for $105. This option is therefore called in the money. Because of this, the option will sell for $5.00 on the expiration date (because each option represents an interest in 100 underlying shares, this will amount to a total sale price of $500). Because the investor purchased this option for $200, the net profit to the buyer from this trade will be $300. When the option expires, IBM is trading at $101. Using the same analysis as shown above, the call option will now be worth $1 (or $100 total). Since the investor spent $200 to purchase the option in the first place, he or she will show a net loss on this trade of $1.00 (or $100 total). This option would be called at the money because the transaction is essentially a wash. When the option expires, IBM is trading at or below $100. If IBM ends up at or below $100 on the option's expiration date, then the contract will expire out of the money. It will now be worthless, so the option buyer will lose 100% of his or her money (in this case, the full $200 that he or she spent for the option). Investors use options for two primary reasons: to speculate and to hedge risk. All of us are familiar with the speculation side of investing. Every time you buy a stock you are essentially speculating on the direction the stock will move. You might say that you are positive that IBM is heading higher as you buy the stock, and indeed more often than not you may even be right. However, if you were absolutely positive that IBM was going to head sharply higher, then you would invest everything you had in the stock. Rational investors realize there is no "sure thing," as every investment incurs at least some risk. This risk is what the investor is compensated for when he or she purchases an asset. When you purchase call options to speculate on future stock price movements, you are limiting your downside risk, yet your upside earnings potential is unlimited. Hedging is like buying insurance. It is protection against unforeseen events, but you hope you never have to use it. Consider why almost everyone buys homeowner's insurance. Since the odds of having one's house destroyed are relatively small, this may seem like a foolish investment. But our homes are very valuable to us and we would be devastated by their loss. Using options to hedge your portfolio essentially does the same thing. Should a stock take an unforeseen turn, holding an option opposite of your position will help to limit your losses. Introduced in 1981, index options are call or put options on a financial index comprising many stocks. Index options usually have a contract multiplier of $100, meaning that the price of an index option equals the quoted premium times $100. Unlike options in shares of stock or even commodities, it's not possible to physically deliver the underlying index to the purchaser of an index option. Thus, index options settle via cash payments. Many times it is in an investor's best interest to lock in recent gains or to protect a portfolio of stocks from a decline beyond a certain price. One way to do this would be to purchase a put option contract on each of your various holdings (this would essentially allow you to "lock in" a particular sale price on each stock, so even if the market crashed, your overall portfolio wouldn't suffer much). However, if you hold a large, diversified portfolio of stocks, then it is probably not cost-effective to insure each and every position in this manner. As an alternative, investors might want to consider using index options to hedge the risk in their portfolios. Many different indices have options available, including the Nasdaq 100, the Dow Jones Industrial Average and the S&P 500. With some careful planning, investors should be able to offset a sharp decline in a portfolio by hedge their overall position with index options. Though it is impossible to forecast exactly how a portfolio will perform during a steep market sell-off, one can get fairly close to the actual result by determining which particular index to use as a proxy for the portfolio and then determining the correct number of options to use as a portfolio hedge. Index options are essentially bets on the overall movement of the market or a basket of stocks. Hedgers and speculators can use them to get exposure to an entire market or entire sector in a single, quick transaction. And like other options, index options offer leverage and predetermined risk. After all, the most the index option trader can lose is the premium he or she paid to hold the options, and the upside can be incredible. It is important to note that equity index options have special tax consequences: 60% of any gain on the sale of the option is taxed as a long-term capital gain; the other 40% is taxes as short-term capital gain income. Naked option refers to an option contract which does not comprise ownership of the underlying security by the purchasing or selling party. It is the opposite of a covered option. Also called an uncovered option, a naked option is a put or call option for which the selling or buying party does not own the units of the associated underlying security. In the case of a naked put option, the purchasing party does not own the underlying units; and in the case of a naked call option, the selling (writing) party does not own the underlying units. To illustrate, if an investor writes a naked call option involving 100 units of stock XYZ, the writer does not actually hold the 100 XYZ units. Likewise, if those same 100 shares are involved in a put option, the purchasing party does not own them. Naked options provide options investors with the opportunity to profit from the respective premiums without having to enter into an actual long or short position. In the event that the market price of the underlying security renders a contract out of the money (OTM), the losses are virtually unlimited. A put option is a financial contract between the buyer and seller of a securities option allowing the buyer to force the seller (or the writer of the option contract) to buy the security. In options trading, a buyer may purchase a short position (i.e. the expectation that the price will go down) on a security. This position gives the buyer the right to sell the underlying security at an agreed-upon price (i.e. the strike price) by a certain date. If the market price falls below the strike price, as expected, the buyer can decide to exercise his or her right to sell at that price and the writer of the option contract has the obligation to buy the security at the strike price. With the exercise of the put, the trader makes the difference between the cost of the security in the market (i.e. a lower price than the option strike price) and the sale of the option to the put writer (i.e. at the strike price). For example, if a trader purchases a put option contract for Company XYZ for $1 (i.e. $01/share for a 100 share contract) with a strike price of $10 per share, the trader can sell the shares at $10 before the end of the option period. If Company XYZ's share price drops to $8 per share, the trader can buy the shares on the open market and sell the put option at $10 per share (the strike price on the put option contract). Taking into account the put option contract price of $.01/share, the trader will earn a profit of $1.99 per share. Investors will often purchase a put option on shares they already own to act as a hedge against the decline in the share price. Puts and calls are the key types of options trading. 1 : the power or right to choose Children have an option between milk or juice. 2 : something that can be chosen Quitting is not an option. 3 : a right to buy or sell something at a specified price during a specified period His parents took an option on the house. What made you want to look up option? Please tell us where you read or heard it (including the quote, if possible).